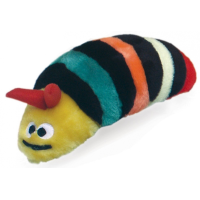 Chatterbox Sea Slug Dog Toy is part of a range on plush toys containing a fun and realistic sound chip. The Chatterbox Sea Slug has been made using extra soft material which has been tightly stitched with no small parts or beads. Very poor quality toy. The sound only lasted for one play session. A week later the toy ripped and found very hard broken plastic part inside which I assume was the sound. Expensive for how long it lasted. Very disappointed.